The last 25 years has seen a huge change in the cruise industry worldwide, with more and larger ships, with more on-board entertainment, experiences and facilities than is imaginable. Often cruise ships rival the world’s best resorts and amusement parks, as well as theatre, offering passengers first-class enjoyment as part of their holiday. Whilst small ships offer the same – but smaller – service, there is no doubt that these floating hotels are in stiff competition in terms of their offering. As a result, dancers and performers are in a fantastic position. No longer do they need to aspire to travel to Broadway, the West End or Las Vegas to be part of huge multi-faceted shows; performing as part of these is possible in addition to simultaneously travelling the world. The shows on-board cruise ships are hugely technical – in terms of the stage craft and the performers – and offer a great many opportunities: dancers, singers, aerial artists, speciality acts, gymnasts, comedians, magicians and roller skaters. The list is endless – similarly audiences are not required to head to London or New York to see top notch entertainment. There has been much direct investment by cruise companies in facilities and experiences to tempt travellers to their particular cruise line or itinerary. Ocean travel is becoming more and more popular, with global cruise travel continuing to experience record growth. The market share for global cruise brands is ever changing, which means the performers employed are too. With the result being a huge improvement in both the quality and quantity of performance opportunities on ships, this is very positive. 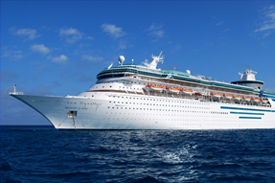 For the performers, securing a contract on a cruise liner is hugely positive too. When they venture to exotic locations like the Caribbean or the Mediterranean, and boast the opportunity to perform in musical productions like Cats, Grease, Mamma Mia or Legally Blonde, the chance to cruise has never been more accessible.